Big Red Chewing Gum isn’t normally available in Britain (although it was briefly sold here in the 1990s) and as such, it has become quite a popular item for people in the UK who visit the United States, many of whom take it home as a souvenir. However, if you enjoy the spicy cinnamon flavour of Big Red, you no longer have to fly across the Atlantic to get it. 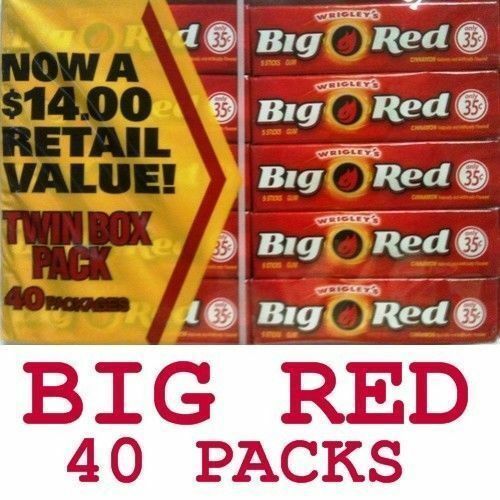 If you have never tried it, Big Red is unique among gums. Unlike the sweet, minty gums available over here, Big Red is hot, so it is not for the faint hearted. However, for many people who taste it, they can’t get enough, and now you can order as much as you like. This pack of 40 will keep you going for a while, and, at such a low price, it is great value for money. If you are a gum chewer and want something that little bit different, Big Red could be just the thing. Introduced in the 1970s by Wrigley, Big Red soon became a firm favourite in the United States. It never really took off elsewhere, but this has only added to its allure. Big Red is now as all-American as hotdogs and baseball, but it is also a great tasting gum.